When transitioning to the ketogenic diet, the first thought most people have is that they get to eat a high fat, low carb diet. This is true — but the quality of what you’re consuming is of utmost importance as well. Fatty meats are a key player in the managing of your health goals. One that may not be mentioned enough is that of pork. Did you know that pork is the top red meat consumed in the world? This is mainly due to its popularity in Asia. Pork contains an abundant amount of saturated and unsaturated fats as well as being a great source of omega-3 and omega-6 fatty acids. This staple red meat is also sure to provide you with key vitamins and minerals. Some of these include vitamin B6, vitamin B12, niacin, thiamin, selenium, zinc, phosphorus and iron. 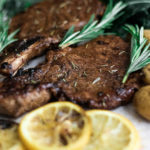 Pork chops are a top keto friendly food that can be eaten with minimal seasoning or can have some added flavor to wow guests and bring the dish to life. In this case, this dish uses a balsamic glaze to give it a little extra kick. The glaze is simple and low carb friendly, including only four small ingredients. In this glaze you’ll find balsamic vinegar, minced garlic cloves, basil and a hint of thyme. Besides it’s abundant fat, what gives these pork chops their kicking flavor is the balsamic glaze they’re coated in before you place them in the oven. You’ll want to prepare the glaze before you sear the pork chops, giving the glaze enough time to cool and develop a thick layer. Once the pork chops are seared, evenly paint the pork chops with the glaze before placing them into the oven to finish them off. Want to wow your guests or take your chef skills up a notch? Try these Keto Pork Chops that are sure to satisfy and fulfill all the flavors you crave.